All First Aid courses include the Automatic External Defibrillation (AED) training. The Automated External Defibrillation course will certify participants to perform the controlled medical act of Public Access Defibrillation using an Automated External Defibrillator (AED). Separate Certification is available. This course provides simple First Aid & CPR techniques taught in an interactive environment, for individuals who want an overview of First Aid & CPR for the home or workplace. The course covers skills needed to recognize and respond to cardiovascular emergencies for adults, CPR Level C and AED, and other topics such as choking, airway and breathing emergencies and prevention of disease transmission. This course meets WSIB regulations for workplaces with five or fewer employees. This course provides comprehensive First Aid & CPR techniques for those who want more knowledge to respond to emergencies in the home or workplace. A variety of topics are covered from basic first aid such as cardiovascular and breathing emergencies, CPR Level C and AED, prevention of disease transmission to more severe sudden medical conditions and injuries to the head and spine. This course meets WSIB regulations for workplaces with five or more employees. Renew your certificates in one day. 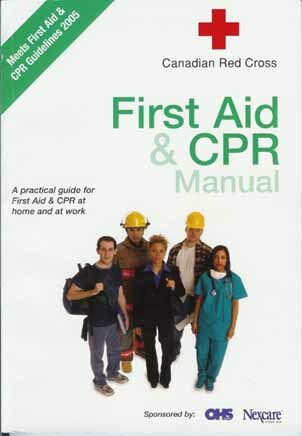 Students must be in possession of a valid (within three years) First Aid certificate and a Level C CPR certificate. It is highly recommended that students review their course material before attending the course. Prerequisites: Valid First Aid and Level C CPR certificates. This Babysitting course is designed for students age 10 – 14. Students will learn the responsibilities of babysitting, caring for children, children and food, handling difficulties (crying, temper, shyness, and power struggles), children and play, recognizing and preventing injuries, handling emergencies (fire, prowlers, gas or water leaks, etc.) and first aid (managing an emergency, artificial respiration, CPR and choking for infants and children, wounds, burns, poisoning, eye injuries, fever, convulsions, and much more). AED is demonstrated.